Banganpalli mango is known as the Pride or Andhra. Enjoy a famous sweet mango known as the Pride of Andhra from the South Eastern region of India. It is also known as Benishaan. A fruit generally weighs between 350 grams and 700 grams. Sweet and Flavorful, we get our fruit from the premium Banganpalli growing regions of India. 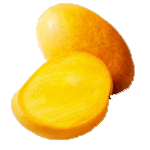 Banganpalli Mango is the most famous mango grown in the state of Andhra Pradesh in India. It is so popular that it is sometimes known as the “Pride of Andhra”. The mango is supposed to have originated in a village in Andhra Pradesh by the same name. Banganpalli mangoes are also known as Benishan. Sweet like Honey when ripe, our Banganpalli mangoes are in high demand during the Mango Season. Our Banganpalli mangoes typically come from the hills of Kadapa in Andhra Pradesh. Here the weather and soil impart a unique flavor resulting in an awesome Yummy fruit!! This fruit has a delicate skin which has big pores. As the fruit ripens, sugar oozes out of the pores, giving it a typical black dotted appearance on a clear yellow skin. The delicate skin of the Kadapa Banganpalli is also consumed along with the fruit by many people as it is very flavorful. 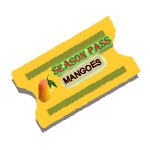 2019 Mango Season is Open for Orders! !